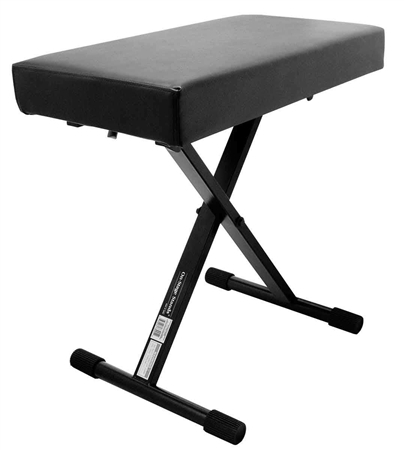 Shop On Stage KT7800 Plus Keyboard Bench from AMS and enjoy Fast & Free Shipping. The KT7800 PLUS keyboard bench offers incredible comfort and outstanding affordability to players of any experience level. If you play extended gigs, or just want a bench that is more comfortable, you will love this padded keyboard bench. This professional-grade, top-of-the line keyboard bench has no equal! The design combines a 3 inch cushion, which provides deluxe comfort for hours of play, with a spring-loaded double deadbolt locking system, which provides deluxe safety for peace-of-mind. Bought primarily for the 360lb user rating. It's solid as advertised. I liked my Quiklok bench better and would spend the extra $20 next time to have that again (sold it all awhile ago). But, not disappointed and it looks nice. No bad BUT not what a $50.00 bench should be. As stated by others imo leather wrinkles. Weak padding for 360 pounds. Rails under bench to lock leg into 3~4 inches short need to have a leg locking point at ends of bench. At lowest position still to high to use as good foot stool for console chair. On Stage Stands does it again! Large seat and adjustable height. Once again, On Stage Stands shows that you can build a quality product and sell it at a fair price. They offer some of the highest quality products for the money. Very well made and extremely sturdy! I like the adjustable height and the overall sturdiness. Would,nt change a thing! Very simple to adjust bench height. It's kind of toneless, but then it's a CHAIR! You won't find a better bench for less! Very well made. Went together in a snap! Just 5 minutes from box to keyboard. Didn't have to fight with the adjustable knobs they clicked right in.